Somehow, it didn’t seem appropriate to call this a bread. I tried that tact when I first made it but Papa agreed that it was far too sweet and moist to be a bread and must, therefore, be a cake. Still it is often listed as a “bread” in cookbooks, and it is made in a bread pan. Admittedly, as a child I hated anything even remotely lemon flavoured. But, oddly enough, as I got older the taste grew on me. I still favor a cherry cake or a zucchini bread over lemon, but occasionally I get a craving for something sweet and lemony. All citrus flavours seem very refreshing and invigorating to me, but lemon is the most refreshing of all. Even the kids will like this loaf and you may have to beat them off of it like leftover birthday cake. 1. Mix all dry loaf ingredients, except the baking powder and soda, together in a large bowl. 2. Add the liquid ingredients and mix thoroughly until the dough is evenly mixed and not too lumpy. 3. Last, mix in the baking powder and soda very thoroughly. 4. Grease two medium-sized loaf pans and distribute the loaf batter evenly in them. Alternatively, you could use a bundt or cupcake pan instead. 5. Bake the loaf for 30 – 40 minutes at 375° Fahrenheit or 190° Celsius. 6. Remove the loaves and let cool for 30 minutes. Begin making the glaze. 7. For glaze mix all glaze ingredients and be sure that the final result is wet enough to pour, but not too liquid, or it will all run off of your loaf. 8. Be absolutely certain that the loaf is cool to the touch. Warm loaves will cause the frosting to become more liquid. 9. Pour the glaze very slowly over the top of your loaf and let it runs just slightly over the edge. 10. Allow the glaze too harden over the next couple of hours and garnish with lemon peel. Enjoy this loaf with some nice warm tea or a glass of soy milk. :) Just don’t eat it all in one sitting. So- if it’s not a bread or a cake….I’m curious as to what the consistency should be when I pour it into the pan? I doubt it will be as doughy as a bread right? *I have an oven that doesn’t quite cook things right, so I kinda like to predict how long it will take! I’ve printed out this recipe- it looks great! Think of it like a very heavy, sticky cake mix. Almost bread dough, but not quite. Sorry I can’t be more specific. Just trust me, its good. Even if you make it a little bit thin, it will just be less sticky-moist and more fluffy, like cake. 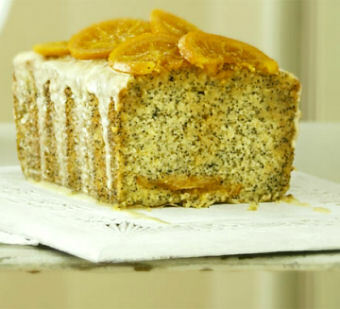 I love lemon poppy seed anything and need to get rid of my jumbo sized bag of poppy seeds. This looks like a wonderful loaf. Is it ok to substitute cow’s milk for the soy milk? Either way, it would make a lovely addition to my pantry. And with the recipe making 2, I could share. Thanks! You can substitute anything you like Sonya. But make sure that your cow’s milk is organic and hormone free. Or else you are getting milk that is not healthy for you AT ALL and that contributed to a very cruel and unnatural quality of life for the cow.